At the second anniversary of his inauguration, public views of Donald Trump’s job performance, as well as his honesty and administration’s ethics, are decidedly negative. Yet opinions about the nation’s economy continue to be positive – and Trump’s handling of the economy remains a relative strength. The new Pew Research Center survey, conducted Jan. 9-14 among 1,505 adults, finds that a growing share of Americans say they trust what Trump says less than what previous presidents said while they were in office. Nearly six-in-ten (58%) say they trust what Trump says less than previous presidents, up from 54% last June and 51% in February 2017, shortly after he took office. The public also continues to fault the ethical standards of top administration officials. Just 39% rate their ethical standards as excellent or good, while 59% say they are not good or poor. While these opinions are little changed from last year, they are lower than evaluations of ethics of top officials for presidents dating back to Reagan. However, more Americans say Trump’s economic policies have made conditions better (40%) than worse (28%), while 29% say they have not had much of an effect. In January 2011, a comparable point in Barack Obama’s presidency, the public expressed mixed views of the impact of his economic policies, with about as many saying his policies made things worse (31%) as better (28%). And Trump engenders more confidence for his ability to make good decisions on trade and the economy than in other areas, especially working with Congress. About half say they are very or somewhat confident in Trump’s ability to negotiate favorable trade deals (51%) and make good decisions about economic policy (49%). Trump’s presidency has been characterized by a favorable economic climate and that remains the case today. Currently, 51% say economic conditions are either excellent or good – among the highest ratings in nearly two decades. 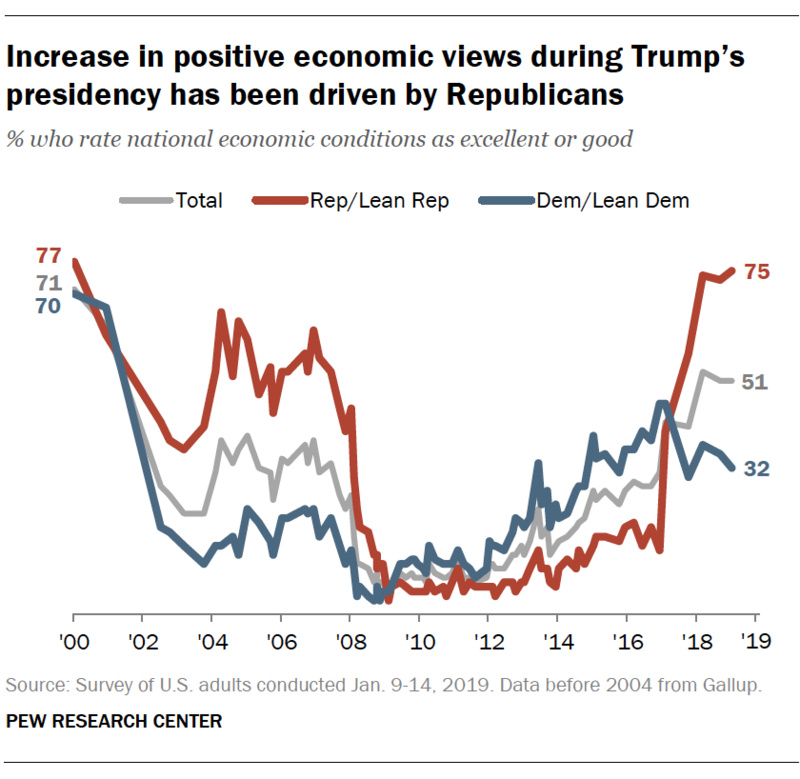 The surge in positive economic views has been driven by Republicans. Three-quarters of Republicans rate the economy as excellent or good, up from just 14% in December 2016, at the end of Obama’s presidency. By contrast, just 32% of Democrats offer positive ratings; Democrats are now less likely to rate the economy as either excellent or good than they were in December of 2016 (46%). The public’s perceptions of the availability of jobs have undergone a similar transformation. For the first time in Pew Research Center surveys dating to 2001, a clear majority of Americans (60%) say there are plenty of jobs in their communities. And while these perceptions also are divided along partisan lines, majorities of Republicans (71%) and Democrats (53%) say there are plenty of jobs available locally. Yet favorable opinions about the economy and jobs have not been accompanied by a rise in public satisfaction with national conditions. For longer than a decade, no more than about a third of Americans have expressed with the way things are going in the country. Today, that figure stands at just 26%, down from 33% in September, with the decline coming among members of both parties. Low expectations for Trump’s legacy. About half (47%) think Trump will be an unsuccessful president in the long run, compared with fewer (29%) who think he will be a successful president; 23% say it’s too early to tell. 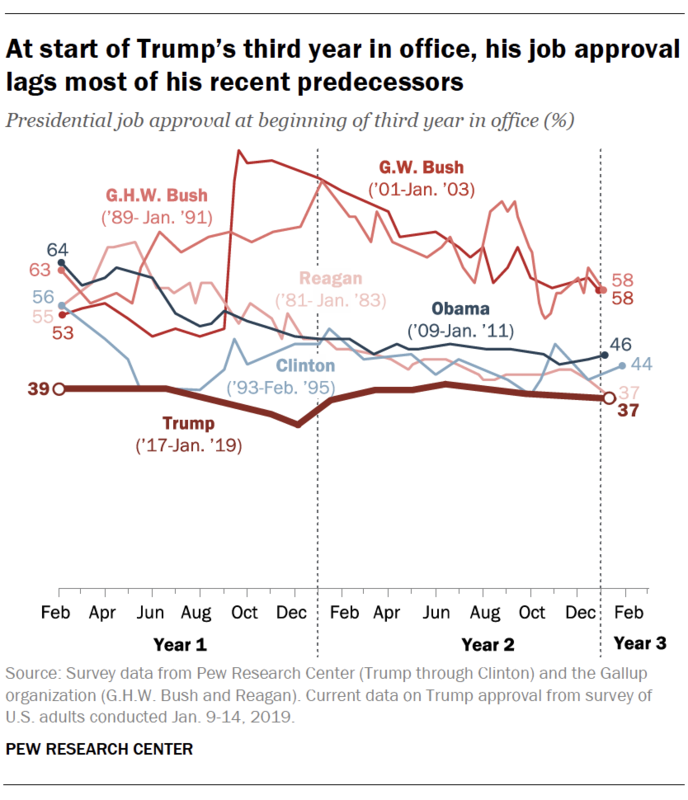 Ratings for Trump are more negative, on balance, than for Obama and George W. Bush at comparable points in their administrations; in February 1995, more said Bill Clinton would be unsuccessful (34%) than successful (18%). Compared with his three most recent predecessors, far fewer say it is “too early to tell” whether Trump will be successful or unsuccessful. Most Democrats want party leaders to “stand up” to Trump. 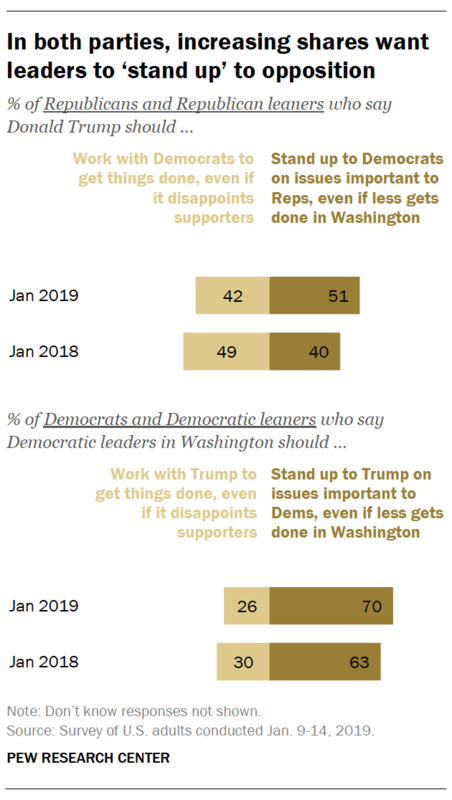 As was the case a year ago, a majority of Democrats (70%) want their party’s leaders to “stand up” to Trump this year, even if it means less gets done in Washington; just 26% want them to try as best they can to work with Trump, even if it means disappointing some groups of Democratic supporters. A year ago, 63% of Democrats wanted their party’s leaders to stand up to the president. Among Republicans, the share saying Trump should stand up to Democrats has increased from 40% a year ago to 51% currently. Majority continues to say Trump has responsibility to release tax returns. As in the past, a majority (64%) says Trump has a responsibility to publicly release his tax returns; just 32% say he does not have a responsibility to do this. Nearly all Democrats (91%) – and 32% of Republicans – say Trump should release his tax returns. Public confidence in Mueller investigation steady. A majority (55%) remains confident that special counsel Robert Mueller is conducting a fair investigation into Russian involvement in the 2016 election. Confidence in Mueller has held steady over the course of the past year, and there remains more confidence in Mueller to conduct a fair investigation than in Trump to handle matters related to the inquiry appropriately.